According to the latest research published by Gartner, smart cities will use 1.1 billion connected devices in 2015, and 9.7 billion by 2020. Navigant Research estimates that the global smart city technology market will be worth more than $27.5 billion annually by 2023, and cumulative global investments in smart city technologies by then will be $174.4 billion. As cities become more connected and systems become more integrated and interdependent; the value of technology becomes more apparent and the transformation towards smarter infrastructure more tangible. The value of IoT and intelligent systems is also increasingly apparent for energy management and utilities. Indeed, utilities and cities are facing challenges and mounting pressure to existing infrastructure due to the proliferation of renewable energy, decentralized and distributed resources, energy storage technologies, electric vehicles and other innovative solutions affecting energy supply and demand. This evolving landscape implies significant transformation of the grid and utility business models. Managing energy on the modern grid requires strong data analytics capabilities, two-way, dynamic communication, and stakeholder collaboration. 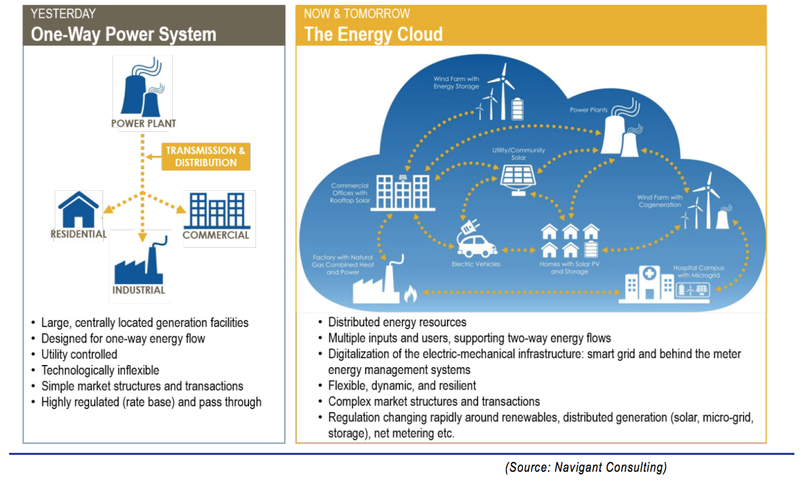 In their recent paper Smart Cities and the Energy Cloud, Navigant Research defines the concept of the energy cloud as “a shift away from a centralized energy generation and distribution architecture […] toward a networked and dynamic infrastructure that incorporates demand-side generation technologies and capabilities and renewable energy technologies alongside traditional assets […] The Energy cloud refers to the platform on which energy marketers, service providers, and consumers will engage to facilitate greater coordination and sophistication in the way in which energy is exchanged”. The research also found that investments in smart energy infrastructure between 2014 and 2023 would amount to $43 billion. However, “connected” solutions are not to be confused with “smart” solutions. A device is smart when it is able to collect information, analyze data and make decisions or take actions on its own without human interaction. Smart grid technologies for example, are enabling a shift towards a more digitized and responsive electricity grid. Given the promising developments ahead, we look forward to what IT has in store for energy management and the utility of the future.